Government information and links are at the bottom of this page. One of the five original Colorado wilderness areas designated by the 1964 Wilderness Act, Mount Zirkel was greatly enhanced by additions in 1980 and 1993. The 1980 enlargement added the Mad Creek watershed, among others, and the 1993 addition included 12 miles of the Encampment River near Davis Peak. In each case, Congress augmented the ecological integrity of the wilderness by combining vital low-elevation forests and rivers with the rocky alpine spine of the Park Range. Major rivers flow from countless glacial lakes along this northernmost stretch of Colorado's Continental Divide. Mount Zirkel and its lakes owe their current shape to Pleistocene glaciation 15,000 years ago. State fish and game managers stock various strains of trout in these lakes, a process which must be repeated on an annual basis. Forest Service managers hope to phase out the stocking of non-native brook and rainbow trout in favor of indigenous cutthroats. According to biologists, it is possible that the hundreds of glacial lakes in Mount Zirkel never supported reproducing fisheries. 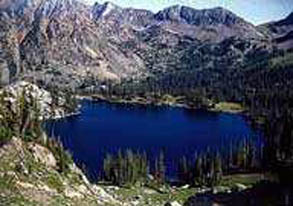 However, since well over half of all visitors here fish, aerial stocking of these high mountain lakes will likely continue. Because of the great attraction of the lakes, camping is prohibited within a quarter mile of many of them. One significant attribute of Mount Zirkel lies in its miles of river valleys. The two major rivers in the wilderness, the Elk and the Encampment, have both been proposed for official designation as wild and scenic rivers by the Forest Service, and offer many miles of lovely valley hiking. NOTE: coloradowilderness.com gratefully appreciates the eloquent descriptions of our wilderness areas provided by Mark Pearson, author of "The Complete Guide to Colorado's Wilderness Areas", Westcliffe Publishers, Englewood, CO. The book also contains many beautiful pictures by renowned photographer and Colorado resident John Fielder. Copyright 1999 IOR Productions. All rights reserved. Its true that these days manufactured homes are perfect for starting a family because Colorado manufactured homes have great structure which last for years. Most people don't realize that Colorado modular homes have the most recent designs which make Colorado homes some of the most contemporary homes available.